On Tuesday night, the Nashville Predators traveled to American Airlines Arena in Dallas to take on the Stars. Nashville was trying to clinch their ticket to the playoffs, while the Stars were trying to better their chances in winning the Central Division. The first two periods were back-and-forth action with both teams exchanging goals, with the scores being 1-1 after the first period including a Ryan Ellis short-handed goal and 3-2 going into the third period that included a Viktor Arvidsson (8) power-play goal. The Preds were throwing everything at the Stars with 12 of their 30 shots coming in the final frame. Coach Peter Laviolette decided to pull Pekka Rinne late in the period. Dallas scored two empty-net goals late to give the Stars a 5-2 victory. This season has been one of ups and downs for Pekka Rinne. The Nashville fans have seen him play well, and have also seen him play pitiful. Over the last two games, Rinne has given up six goals and has a save percentage of .829. 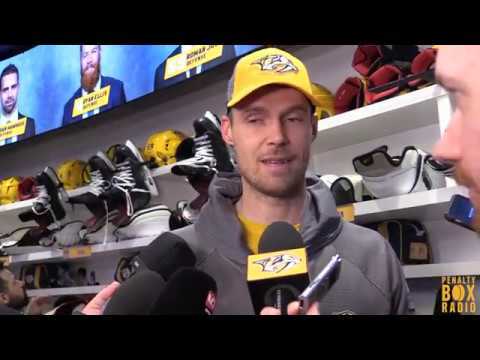 So, the question has to be asked… Is Rinne going through a slump again or is it just a minor hiccup? Before he was pulled against Colorado after ten shots, Rinne had five straight games of a save percentage above .900. The Preds have not announced a starter tonight against Pittsburgh. This would be a good spot for Carter Hutton to get the nod and give the Kempele, Finland native a break. Rinne leads the league in games played for a goaltender with 63. Against the Stars, Ryan Ellis blocked a shot up high in the first period and did not return with an upper-body injury. Coach Laviolette stated that the team would evaluate him on Wednesday. It doesn’t look good as of right now. The Preds called up from Milwaukee Stefan Elliott under emergency conditions. In 29 games with the Admirals, Elliot has six goals and 11 assists this season since being acquired from the Coyotes. He has experience playing on the NHL level and has played in 82 regular season games. The Preds cannot afford injuries right now. The team has been relatively healthy this season and losing Ryan Ellis for an extended period of time could be a big loss for the defensive corps. The Predators opponent tonight has been one of the hottest teams in the NHL over the last ten games. Over this set of games, the Pittsburgh Penguins have won nine out of ten with their only loss since March 11th coming last Thursday against the New Jersey Devils (3-0). Their wins have come against top-level talent of the NHL in teams like the Capitals, Islanders, and two wins against the Rangers. As usual with the Penguins, they are being led in goals (32), assists (47), and overall points (79) by Sidney Crosby. The Predators will have a tough test and will need to be on top of their game against an offensive-minded Penguins squad with former Preds Matt Cullen and Patric Hornqvist. The Predators will look to get back on track tonight in the Steel City. Be sure to catch all of the action on Fox Sports-Tennessee, NHL Network, or you can listen live on 102.5 The Game. Puck drops at 6:00 pm!